A college man will spend approximately 19,200 hours, the equivalent of 800 days, outside of the classroom during four years on campus. That unstructured, out-of-classroom time has become a challenge for today’s young men who leave a highly structured and supervised high school lifestyle to face the many distractions and tough choices that college can bring. A number of trends show that college men are falling behind in taking advantage of their college experience. 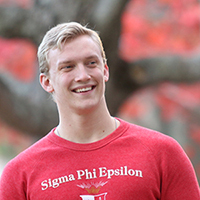 SigEp offers an experience that integrates academic excellence and personal development to prepare members for a successful life after college.